One pair of plush white mickey mouse gloves. Are you ready to be the mouse with the most? We know that life gets busy and sometimes you just don't have the time to put together the newest and most innovative Halloween costume. We totally get it! But now you can save time and play it safe by dressing up as the classic Walt Disney mascot! I mean Mickey Mouse has been around since 1928 so obviously the little animated mouse is doing something right! 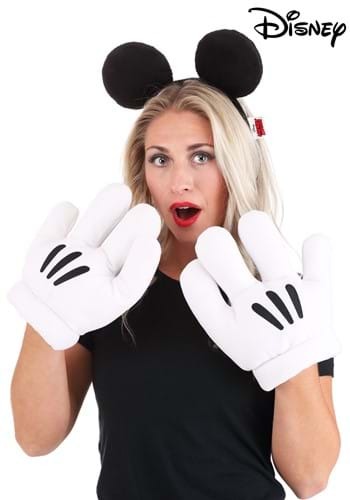 When you slip on this pair of plush, extra padded Mickey Mouse gloves and headband, you'll look like you've just walked straight out of Walt Disney Studios. Not only will you transform into everyone's favorite mouse, this Mickey Ears & Glove Set will give you the confidence to sing, dance and whistle all of your favorite Disney movie tunes with ease. I mean after all, you are the world's most lovable character!